“Arrival” (2016). Cast: Amy Adams, Jeremy Renner, Forest Whitaker, Michael Stuhlbarg, Mark O’Brien, Tzi Ma, Jadyn Malone, Carmella Nossa Guizzo, Abigail Pniowsky, Julia Scarlett Dan. Director: Denis Villeneuve. Screenplay: Eric Heisserer. Story: Ted Chiang, “The Story of Your Life.” Web site. Trailer. When linguistics professor Dr. Louise Banks (Amy Adams) shows up to teach her class one day, she finds the lecture hall nearly empty. She’s somewhat surprised but decides to proceed as usual until one of her students receives a call on her cell phone, who then asks that Dr. Banks turn on the classroom television to one of the news channels. Upon doing so, she and the few remaining students learn that a dozen alien ships have arrived in various locations around the globe. The enormous crafts are quite imposing but don’t appear to be an imminent threat. Nevertheless, jets are scrambled, blockades are set up and a state of emergency is declared. And class, needless to say, is canceled when a university evacuation is ordered. Dr. Banks returns home to await what’s next. But, before long, she’s contacted by Colonel Weber (Forest Whitaker), a special forces military officer with whom she worked on special projects in the past. Because of her linguistics proficiency, she proved a valuable asset in translating messages related to the war on terror. If she were so helpful in that context, authorities presume, then she must be the go-to person to tap in learning how to communicate with aliens. Dr. Banks is quickly whisked off to Montana, one of the alien ship landing sites. 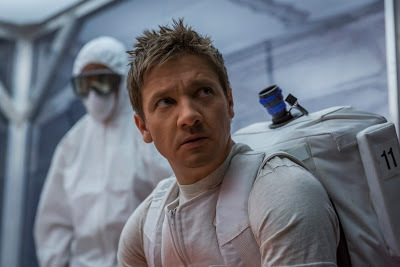 She’s teamed with theoretical physicist Ian Donnelly (Jeremy Renner), who’s anxious to learn secrets of the aliens’ technology. However, before tackling such complex tasks, Dr. Banks suggests that they address more basic matters – like saying hello – first. Backed by Colonel Weber, Dr. Banks sets out to determine who the visitors are and what their reason is for coming here. This thus sets in motion a remarkable journey of discovery that transcends such obvious questions, prompting Louise, Ian and the Colonel to reassess their views on the very nature of reality and our individual and collective places within it. And, with a world quickly broaching the prospect of global war because of this development, the trio of investigators had better work quickly, not only for humanity’s sake, but also for that of the new arrivals. 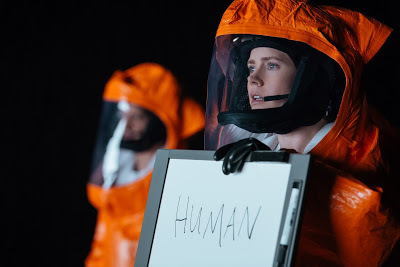 Deciphering an alien “language” is the objective of linguistics professor Dr. Louise Banks (Amy Adams, back to camera) in the thought-provoking new sci-fi thriller, “Arrival.” Photo courtesy of Paramount Pictures. As the story unfolds, the film becomes more than just another movie about aliens. It goes much deeper to explore what it means to exist, the nature of reality and even the essence of time. This is heady material, to be sure, but it prods viewers into taking a deeper look at who we are, how we live our lives and how we view the functioning of existence. In that sense, the picture is as much a metaphysical treatise as it is an inventive work of fiction but one that truly gives us pause to consider the core of being – and what we might want to do with it. The ramifications of what’s at stake in this film, both between us and the aliens and amongst ourselves, couldn’t be higher, yet, ironically, they rest on the most fundamental of considerations. If we’re to bridge the gaps between us, be it across species or across cultures, we must be able to understand one another. And, if we’re to achieve that, we must first believe that it’s possible, an essential element of the conscious creation process, the means by which we manifest the reality we experience through the power of our thoughts, beliefs and intents. As Dr. Bank’s mission clearly illustrates, under such circumstances we must specifically work on establishing beliefs related to our communications skills, particularly the ability to make them function clearly and smoothly in both directions. However, as the intrepid linguist discovers, this involves more than just figuring out the word equivalencies from one language to another. It also requires that we understand the fundamental prevailing worldview that underlies each language in the first place. And, to appreciate that other worldview, we must understand the core beliefs that form its basis, which ultimately may be far different from those that we employ in shaping our outlook. Dr. Louise Banks (Amy Adams) heads a team of experts seeking to establish communication with an alien race in the profound new sci-fi thriller, “Arrival.” Photo courtesy of Paramount Pictures. With potential differences like that, even getting to the most rudimentary aspects of communication and understanding could prove incredibly daunting. Dealing with that can be challenging enough from one terrestrial culture to another. But, when we apply this notion to our interaction with a totally foreign species, the ante can be upped considerably. Suppose, for example, we believe that the functioning of reality operates according to certain fundamental, mutually agreed-upon concepts. But what if another species is convinced that existence relies on a completely different set of underlying principles? Our heartfelt convictions and basic assumptions about the nature of reality – and our ability to attempt to communicate about it – would run into a major roadblock before the process even starts. This brings us back to the importance of sincerely believing that communication and understanding across the species boundary is genuinely possible. If we’re unable to envision such a possibility, however, we’ll never get past square one. But, if we allow ourselves to believe that such dealings are truly possible, we open the door to making them happen. This involves each side making it possible for the other to understand the beliefs that it holds about the fundamental operation of existence. This involves addressing such questions as how does our reality arise? What qualities govern its operation, be they physical, metaphysical, temporal or spiritual? Does everything that happens have an underlying message or purpose, and, if so, how do we discover what they are? Is our existence predetermined and set in stone, or does it make allowances for variability (and, if so, how)? An enormous alien craft, one of 12 that have landed around the globe, harbors an enigmatic metaphysical secret in director Denis Villeneuve’s impressive new release, “Arrival.” Photo courtesy of Paramount Pictures. As humans, even if we speak different languages, most of us probably agree to a great extent on the answers to those questions. But, when we attempt to communicate with those of another species, the answers may be very different or even unanswerable. This is where we need to look at bridging our gaps in understanding, and that, again, begins with the beliefs we hold about such possibilities going into the process. Many of us may have rarely, if ever, given much thought to these kinds of concerns. However, if we hope to succeed in our aspirations of reaching out to beings on other worlds (or even in other dimensions) as full-fledged, actively participating citizens of the Universe, maybe we had better start giving more consideration to these ideas. We must get past the basic assumption that everyone (including those belonging to other species) all think and believe along the same lines. Such a narrow view could well derail our efforts in these areas before we ever get started. If we really are the inquisitive explorers we profess ourselves to be, we’d be wise to let our consciousness expand, to take a wider view and adopt such an enlarged outlook, lest we be reconciled to isolation or, even worse, the possibility of misunderstandings that carry devastating consequences. The lesson in this shouldn’t be lost in our dealings amongst ourselves either. Given the myriad challenges we face on the planet these days, perhaps we should consider taking a closer look at cooperation, rather than competition, in how we relate and interact with one another. Attaining that goal is possible, but, once again, it requires us to embrace beliefs in its feasibility, including those related to envisioning the outcome and being willing to understand the foundational principles that shape our languages, cultures and fundamental worldviews. We might be surprised at what we find, too; we may assume that we have many differences, but we might also find that we have much in common, attributes that can serve as starting points in building bridges over the gaps between us, enabling us to reach a new level of mutual understanding that elevates us to places we may have never before dreamed. It truly could lead us to an “arrival” at a whole new level of awareness about ourselves, our existence and our place in it. In addition to these grand concepts, many other ideas are explored in this film, most of which are dealt with on a very personal level, as Dr. Banks discovers for herself as she wends her way through the labyrinth of her remarkable odyssey. In many ways, though, what she experiences individually mirrors the story’s bigger questions writ smaller. In either case, though, the lessons raised through the narrative can serve us well, whether we’re talking on a personal level, a cultural level or even a species level. Theoretical physicist Ian Donnelly (Jeremy Renner) is part of a team of experts seeking to establish communication with an alien race in the profound new sci-fi thriller, “Arrival.” Photo courtesy of Paramount Pictures. Without a doubt, “Arrival” is one of the best movies I’ve seen in a very long time. Its suspenseful, atmospheric mood, along with its profound metaphysical message, heartfelt narrative and understated performances, combine to deliver one of the most impressive pictures to come out in years. Director Denis Villeneuve’s edge-of-your-seat, edge-of-your-consciousness thriller succeeds where predecessors like “Interstellar” (2014), “Gravity” (2013) and “2010” (1984) came up short or delivered their messages in much less thoughtful or poetic ways. Those who take the time to truly understand this picture, in much the same way as ardent fans of “Signs” (2002) did, will come away richly rewarded. As for me, I left the theater awed and speechless, and, if you approach it with a similarly open mind, it just may do the same to you. In an age of rampant polarization (as clearly evidenced by the recent presidential campaign, as well as in a host of other milieus), the need to come together couldn’t be greater. But we must be willing to make a concerted effort to see this through. Failure to do this could leave us full of regrets and dashed hopes, but such undesirable outcomes are indeed avoidable. And to think it can all start with something as simple as effectively learning how to say hello.